This software is free. However, in order to remove the "nag screen" you have to receive a registration code from the developer. To receive a code you may either donate using PayPal, help solve a technical problem or develop a new feature. SynthFont is a tool for playing MIDI files making use of SoundFonts. With SynthFont you do not need any particular sound card. In fact, if you only want to render audio files ("WAV" files) you don't even need a sound card. SynthFont makes it easy to assign different SoundFonts to difference MIDI channels. It comes as both a Standalone applications and also as a VSTi Plugin. More Meta tags for compressed files, for example ISRC. The meta tag editor could not be accessed from the Save Audio dialog. MIDI Portamento Support (CC#5 Portamento Time. CC#65 ON/OFF, and CC#84 Portamento Control). In the Pianoroll, Controllers graph, drawing events that are of boolean nature (ON/OFF) will let SynthFont2 display a dialog to choose ON or OFF. The Pianoroll is now correctly drawn also with the display in portrait mode. Fix for looping not working with Stop set to End in the playback range. Fix for VST effects remaining in memory and showing up in the wrong place. Support for multiple time signatures. Smooth playback scrolling of the Pianoroll. Support for creating one more compressed audio format: M4A, based on the free AAC format. Support for creating compressed audio files using Variable Bit Rate. Support for multiple CPU cores. Support for some Windows 7/8 enhancements. VU meters for the MIDI channels. Function to quickly determine the maximum loudness of a song. 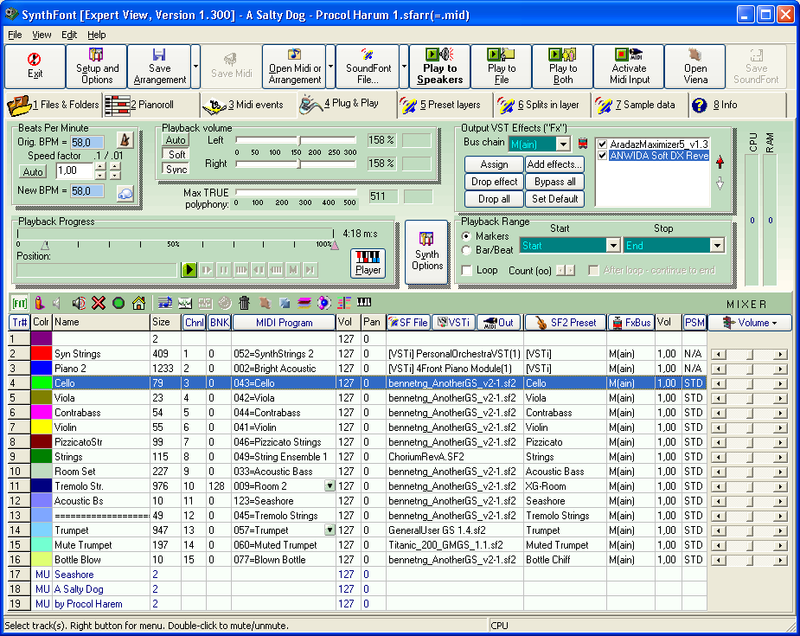 MIDI data can be saved in the Arrangement file. Various other minor improvements and new features. New features added for registered users including Leardini system, new GigaSampler dimensions and Apply to the MIDI file Mixer fuction. Bugfix for sending exception reports. Changes in the MIDI programs of a track were not reflected in the track's layers. Some odd MIDI files where not read, leaving SynthFont in an eternal loop. Bugfix for MIDI files being cut short at the end when playing. Bugfix for assigning a VST bus to track 1. In the VST editor windows, press name to change the name of the preset. When you delete an Arrangement file, all VST effect preset file define for the arrangement are also deleted. Versions 1.554 and 1.555 had a bug causing it to draw the Pianoroll badly when the Grid Size was set to more than 1. Additionally the "Show Scale" checkbox in "Key Signature and Melodic Scale" did not work (notes were not grayed). Some MIDI files were not correctly read. Keys used as shortcuts could not be used to navigate to files in the Explorer list. After editing and saving a SoundFont group file in use by a track, the track presets were not updated. The playback position in the Pianoroll did not respond to a user change of the BPM factor (in "Plug & Play"). In the virtual keyboard you now have the option to define the key velocity either by the vertical position of the mouse pointer (default) or by using the mouse wheel. To select method, use the right mouse button to pop up a menu with a new item called "Options". In the toolbar of the Explorer files list there is a new button with traffic lights. Check to have SynthFont play the tune immediately after loading it (you must double-click to load it). Also see the Autoplay checkbox in the "Play options" box at the top-right corner Files/Folders window. In the Pianoroll, when using the eraser to eras note you previous had to move over the note, now it is enough to click on it. In the Pianoroll, under the list with tracks, there is a new Solo button. Press to play the selected track only when playing. When creating a new midi file you were previously asked to save it at the same time. This no longer happens. SynthFont 1.520 might hang at the end of a song when playing with VST instruments. For DLS-files, the Envelope Sustain level was not always correctly interpreted. In Pianoroll, when moving over the lines, a hint window will display the key number and note. Use the context menu (right mouse button) to hide/show this message. In Pianoroll, "Edit track", "Change time (position) of events", the limits were wrong when using "Move events BELOW the limit" or "Move events ABOVE the limit". Setting the velocity to 0 for a note actually deletes the note. Now you can not set it to lower than 1. The velocity of a note when using the virtual keyboard to play, is determined by the vertical position of the mouse pointer on the key. This value was incorrectly computed for black keys. Fixed a larger number of crash report bugs. Sound File Manager - scan through all of your folders with SoundFonts (or *.GIG, *.DLS, *.PAT files) and listen to and compare Presets. Use Ctrl+W or the new button in the tracks list header or a menu item to display this tool. In the Extended mixer the behavior of the up/down spin button has changed. Normal spin is no with larger increments. Hold CTRL key down to spin in smaller steps. Posted by Bob H on Thu, 02/26/2009 - 20:12. I love the PAN spread facility, which I use to put the bass to the left and the treble to the right, and give me a real stereo effect as the keyboard is played. Instead of someone splitting the hands to give two to four staves, and assigning PAN values to each stave, SynthFont assigns each individual KEY on the keyboard a value from left to right as if you were sitting right in front of the keyboard [or the opposite if you prefer to be sitting right behind the upright piano] and thus puts the sound for that key to the left to right according to its placement. No other software does that... I use it with a 200% spread as well, to increase the spread of the sound, and then use earphones. You can really hear the difference when you do that, whether it is simply to listen to the midi being played or to create a wav or wma or ogg or mp3 file for use elsewhere. Try it with almost any rag downloaded from the Perfessor Bill Edwards or the James Pitt-Payne web sites and you will immediately hear what I love about the use of PAN spread [unless the sound font you use already does that based on the specific key(s) pressed, which some do]. Posted by NJBeep on Sat, 06/28/2008 - 18:11. Emu Proteus X... Those extra filter are just amazing! In fact I use Chainer to create the basic SF2 then loop the samples in Viena..
Then test the SF2 in Vienna and convert to use in Proteus X.. all this until I get Emulator X and can sample directly. So to my point.. is Viena going to be able to work with 24 bit samples?? Posted by Clarry on Thu, 03/02/2006 - 03:59. I'm really pleased its installed and I can hear the lovely sound fonts when I click the 5 layers button. What confusing is that when I click to add a soundfont on my pc, it shows up on the screen, but when I playback its sounds all garbled. I opened in Windows media Player 9 and the old GM instruments are playing my saved midi which I've thought I'd already changed the track instruments for. Posted by yenny colmenares on Wed, 03/01/2006 - 21:10. Posted by Ukulele Al on Wed, 11/02/2005 - 00:20. The software works well and has one feature that is very valuable for me: You can render a whole MIDI arrangement to .wav with each track its own .wav file. That saves me a lot of time. Before I had to go through a bunch of time consuming monkey motion to get that done; now it just take a mouseclick. Posted by georgenhuj on Sun, 08/21/2005 - 12:02. Great freeware. I love it! As a guitarist, very useful for making bt's and rendering midi files. Am waiting for the non-beta version. Thank you very much Kenneth. You're a GOD. Keep up the good work. Posted by A-Void on Tue, 08/03/2004 - 05:05.